University of Texas Rio Grande Valley defenders Barbara Silva (20) and Talita Oliveira (5) attempt to block an attack by Kansas City in a WAC regular season final at the UTRGV Fieldhouse on Saturday, Nov. 17, 2018, in Edinburg. With about eight or nine matches left in the regular season, UTRGV volleyball coach Todd Lowery was still searching for the best possible rotation for his squad. When the Vaqueros play today in the semifinals of the Western Athletic Conference Tournament — as the No. 1 seed riding an eight-match win streak — it’s probably fair to say mission accomplished. The team convened Thursday to watch Cal St.–Bakersfield fall at the hands of Utah Valley — the team the Vaqueros will take on at 6:30 tonight. The championship match is slated for 9 p.m. Saturday. Bakersfield is the host club. On Wednesday night, UTRGV’s Ragni Steen Knudsen, a senior outside hitter, was named WAC Player of the Year. Of course, Knudsen played a prominent role in every one of those rotation differences. A hard-hitting attacker who can also place the ball down the line or cut it hard cross court, Knudsen is also an aggressive server who had runs of nine points twice in the regular season conference clinching match against Kansas City. She also provides the team a powerful back-row .hitter that has to keep the opposing middle hitters honest and opens up the outsides just a little more. 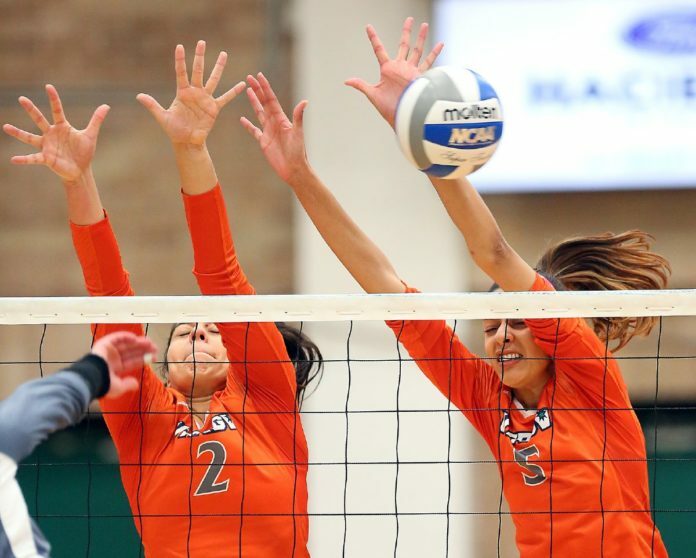 “She’s one of the best I’ve ever played with,” said UTRGV libero Gysell Zayas, who has made spectacular defensive saves all season, climbing into the stands on more than one occasion to keep a ball in play. “Her dynamic being and athleticism defines this team. There’s definitely a spark between me and her and sometimes we don’t need words; I can just feel her presence. UTRGV went 22-8 overall and 13-3 in the WAC. The Vaqueros split matches with Utah Valley, winning at home and losing on the road. UTRGV’s eight-match win streak not only propelled them to the top seed for the tournament, where the winner gets an automatic bid to the NCAA tournament, but it also shot the team to No. 69 in the Ratings Percentage Index (RPI).